I’m not one to take chances on books. I read stuff that English teachers like. Maybe a best-seller once in a while, but while I was on Reddit, I happened to get an ad for a book and the cover art caught my eye. 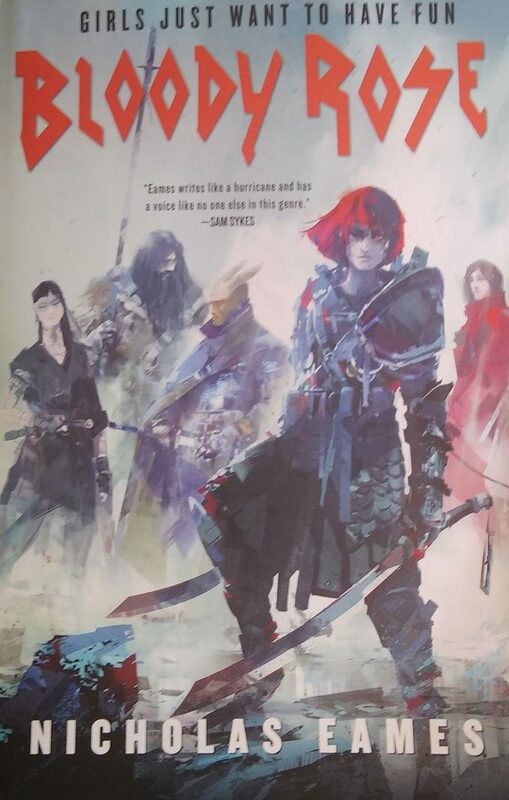 A red-headed woman stood in front wielding two single-edged swords blotched in blood while behind her, four incredibly distinct character designs stand draped in an impressionistic fog that gives the whole picture a kind of fluid movement. One impulse-buy on Amazon plus two days and I had read the whole thing and it lives up to its wonderful cover. 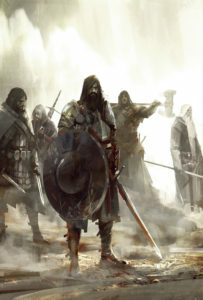 Cover art for Kings of the Wyld by Nicholas Eames. 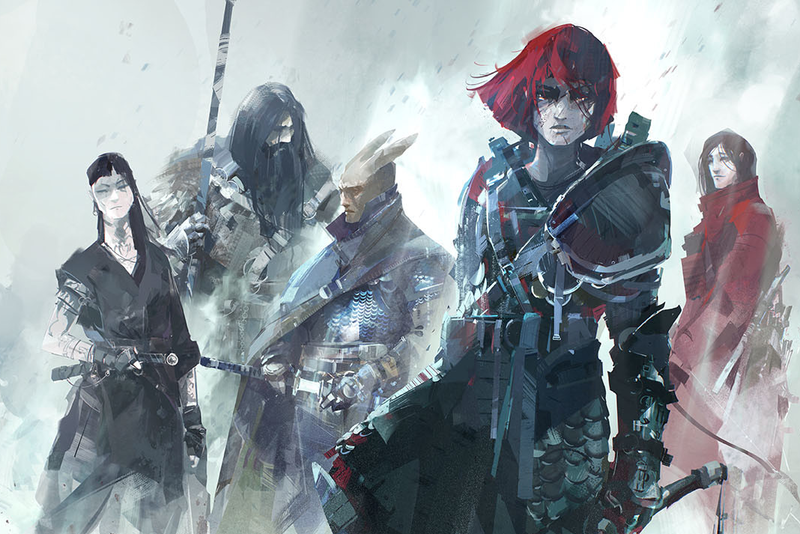 Art by Richard Anderson. Bloody Rose is the second book from author Nicholas Eames published by Orbit Books. It’s a loose sequel to his first book, Kings of the Wyld, which I have yet to read but Bloody Rose stands strong on its own. The book takes us to the world of Grandual, where monsters roam the countryside and bands of mercenaries make their living fighting to protect cities and towns from them. Our main character is Tam Hashford, the daughter of a mercenary mother and a bard father. She’s stuck in the little town of Ardburg, dreaming of action, adventure, and girls. But all that changes when she gets the chance to become the bard for the infamous Bloody Rose and her band of mercenaries. Soon, she finds herself going to grand (or not-so-grand) arenas to fight monsters for crowds’ amusement, traveling north to a mysterious job involving a widow and a problem she needs solved. Meanwhile, hundreds of mercenaries head west to fight a horde of monsters threatening to destroy civilization as humans know it. I’ll be honest, I haven’t read a high-fantasy book in a long time. About a year ago, I read C.S. Lewis’s Till We Have Faces and that was the closest thing to a high fantasy book I’d read since high school, I blame Eragon. But I remember the high-fantasy I read. It was focused on contextualizing the past. How did the evil ruler come to power? Who will fulfill the ancient prophecy? Whose ancestors annoyed someone else’s ancestors? Who will be the hero to return things to what they used to be? There’s nothing wrong with this. These ideas and themes make for some great stories and characters. Bloody Rose mostly ignores them. Sure, the book has some aspects of reflecting on the past. There’s an ancient fallen empire that’s pretty important. There’s some background on monsters that adds a lot to the story. Less traditionally, there’s a bunch of references to music from the 80s and at least one joke lifted straight from Dumb & Dumber, which I’m counting as reflecting on the past. But Bloody Rose is much more focused on the future. There is no status quo the characters are trying to get back to. If anything, the book is about defeating the past and moving on to the uncertain future. Grandual is a world of possibilities and this book only made me want to read more of them. Eames wears his Sword & Sorcery influences on his sleeve. The D&D styled setting takes surprising twists and turns as the story does the same. It makes for a world that feels familiar but colorful, a bit of extra rum in the coke. Buy this book, or borrow my copy. Whatever you need to do, just read it. If you’re still not convinced, try out the first chapter for free on Orbit’s website. Life is too short to miss out on the joys of a great book. Take a chance on it.